Home » Reviews » Broadway Reviews » On Your Feet! You won’t have a lot of choice in the matter. You will do as the title tells you and be On Your Feet because this dazzling and delightful musical will lift you up like nobody’s business. Biographies in the theatre are rarely done well because the authors are more in love with the facts than the story. Here the authors (Alexander Dinelaris and Gloria and Emilio Estefan) have let the music do the talking and the story follow in its footsteps. The result is a perfect 10. Fun, tears, greats songs and dancing. Those of you who remember the 1980s may remember Ms. Estefan and the Miami Sound Machine (whose leader Emilio Estefan she married in 1978). And if you are not familiar, once this rocking orchestra and magnificent cast get done with you – you will remember. Just like you WILL be on your feet. Through a series of flashbacks we see Gloria as a girl (Alexandria Suarez) in Cuba, singing and dancing because that was in her spirit and heart. Her family fled to Miami as Batista was overthrown. As part of that departure, gloria’s mother – also Gloria (Andrea Burns) – lost her dream of performing. As Gloria (Ana Villafañe) turned into an adult with her own songs to sing, her mother was the last one on the support train. Rather it was her grandmother Consuelo (Alma Cuervo) who pushed and encouraged. 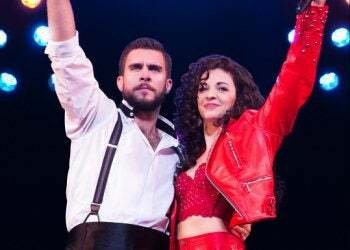 Eventually Gloria caught the eye of a certain Emilio Estefan (Josh Segarra) – leader of Miami Sound Machine – who became Gloria’s first and only love. As their music evolved so did their relationship, and the two became and remain a formidable team. Originally relegated to Spanish speaking venues and radio stations, the two of them planned and negotiated to rebrand – as we say today. Their journey was not paved with gold and they played every gig they could scrounge – weddings, barmitzvahs and more until the powers that be finally came to the music and felt what was happening. Eventually the walks came ambling down and Estefan became a chart topping success. The success brought problems of its own – exhaustion and living out of a suitcase. And there was that horrific accident that landed her in the hospital with the possibility that she would never walk again. But she survived and thrived with a breathtaking comeback 18 moths later on the American Music Awards. The warp and woof of story and music blend to make an evening that does justice to Estefan’s tale. This show dose not pretend to be anything other than what it is: a story of the delicate web of family (Eliseo Roman as Gloria’s father Jose and Ms. Burns are featured brilliantly and prominently as the lynchpins to this story), friends, fame and fortune. There are no guarantees in life. The road is paved with disappointments that are experienced on your own, because it only seats one between your ears, but that can be witnessed and shared with family into which you are born and family you create. This is a story of immigrants who make good. This is a story of passion and determination. This is a story of an American dream by way of Cuba. For some reason the list of songs is placed deep into the program after the Who’s Who. I give them to you here because very likely this will be one of the first things you research when you leave the theatre, so that you can download the entire collection. On Your Feet will make you understand on a visceral level that Estefan is a national treasure. Beginning with Ana Villafañe, whose voice is as magnificent as her spirit and who is rarely off stage, this cast is exquisite. Jerry Mitchell’s direction is light and to the point. Sergio Trujillo’s choreography makes you feel like you could get up there and conga with the best of them. In other words this is a fantasy tale of a reality experience that pulls you in, get’s your hips swinging and hauls you to your feet. Brava! "The recipe may be familiar, but the flavor is fresh in 'On Your Feet!,' the half-formulaic, half-original and undeniably crowd-pleasing musical about the lives of Emilio and Gloria Estefan." "A paint-by-numbers portrait can still be colorful — and a kick. Case in point: 'On Your Feet!,' a predictable but entertaining show about Gloria Estefan and her music-producer husband Emilio." "'On Your Feet!'... is a fine addition to the ranks of jukebox musicals." "Already proving a solid crowdpleaser in previews, the show features a star-making lead performance from radiant newcomer Ana Villafane." "Newcomer Ana Villafane (who originated the role in the show’s Chicago premiere) is a knockout in the leading role, the dazzling centerpiece of this flashy, splashy spectacle helmed by Jerry Mitchell."